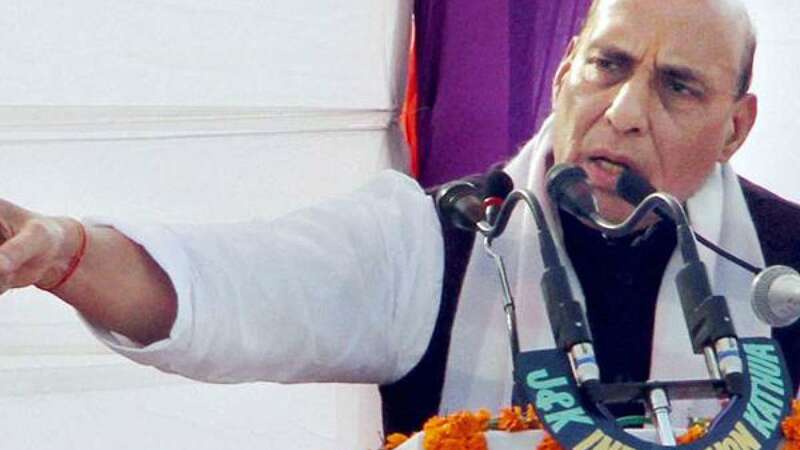 Kathua : Home Minister Rajnath Singh has given a stern warning to the neighbouring nation Pakistan for its tactics to spread religious divide in India, claiming that it will be divided into 10 nations if it failed to quell terrorism. "Pakistan is conspiring to divide India on religious lines but it will not succeed. We were divided in 1947 on religious basis. We have not been able to forget that... All Indians are brothers, whether they are born from the womb of a Hindu mother or a Muslim mother," he said addressing a Martyrs' Day function in Kathua district. Singh accused Pakistan of waging a proxy war against India. "We want to live in peace with Pakistan but it has indulged in sponsoring a proxy war against India. Every Prime Minister of India wanted to mend relations with Pakistan but it did not understand the language of peace and attacked India four times. But our brave soldiers gave them a befitting reply." Indirectly, he also spoke out loud about the weakness of Pakistan. "Terrorism is the weapon of the weak and not the brave," he said. "Pakistan came into existence after India got divided on religious lines but it could not keep itself united. In 1971, it got split into two and, if it does not mend its ways, it will get splintered into 10 pieces and India will have no role in it," he said.